Philip Leslie Hale (1865-1931) is best remembered for his role as both artist and teacher at the School of the Museum of Fine Arts. He was part of an influential Boston family—the son of writer, historian, and minister Edward Everett Hale, brother of artist Ellen Day Hale, and married to the artist Lillian Westcott Hale. In many ways Hale is a classic example of the Boston School: academic, under recognized during his lifetime, and critical of modern movements. Conversely, Hale’s foray into a Symbolist style at theturn of the twentieth century was a marked diversion, andDeianira, Wife of Heracles, Being Carried Off by the Centaur Nessus (c. 1897) is a rare example of the artist’s work from this period. A movement that originated as a literary concept in France in the 1880s, Symbolism soon encompassed the visual arts as well. Symbolist artists favored mood and feeling over representation, and their works often referenced classical or moralizing themes. 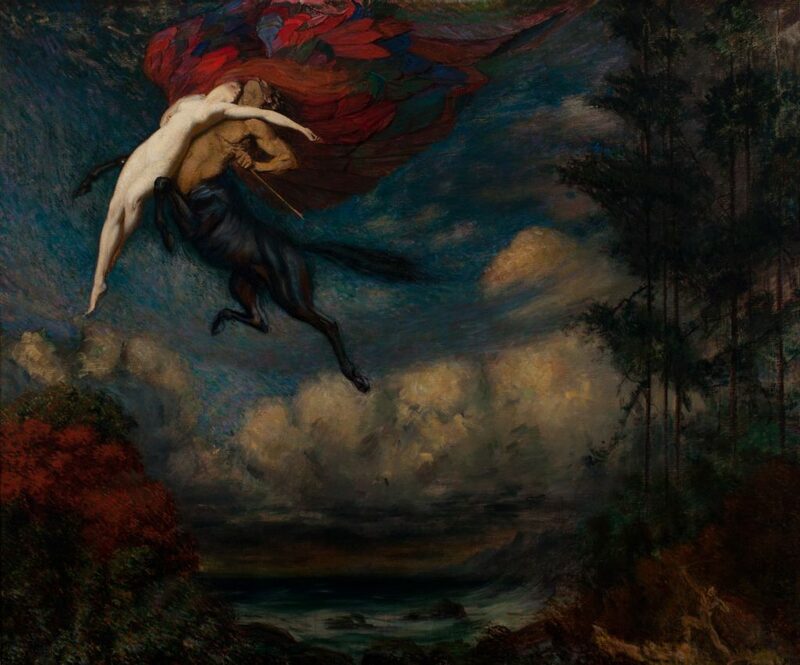 One of the original titles for Hale’s work, the moody Flight of the Night, indicates a Symbolist influence. The use of color and compositional structure align this work closely with what Hale was seeing while studying in France in the last years of the nineteenth century. While critically reviewed during his lifetime, Hale’s Symbolist works were not considered salable, and they remained in his studio until his death.